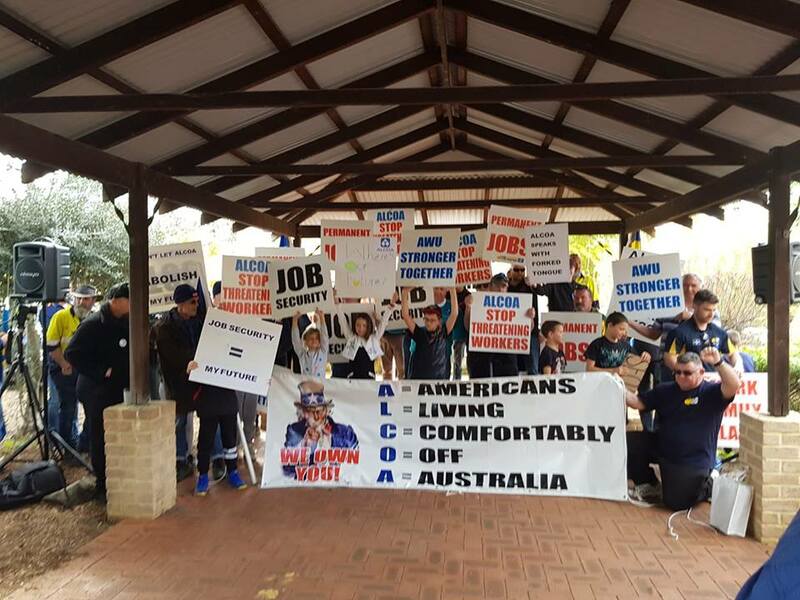 Alcoa Corporation (Aluminium Company Of America) has recently moved to terminate the Enterprise Bargaining agreement of employees who are members of the A.W.U and currently undertaking strike action. 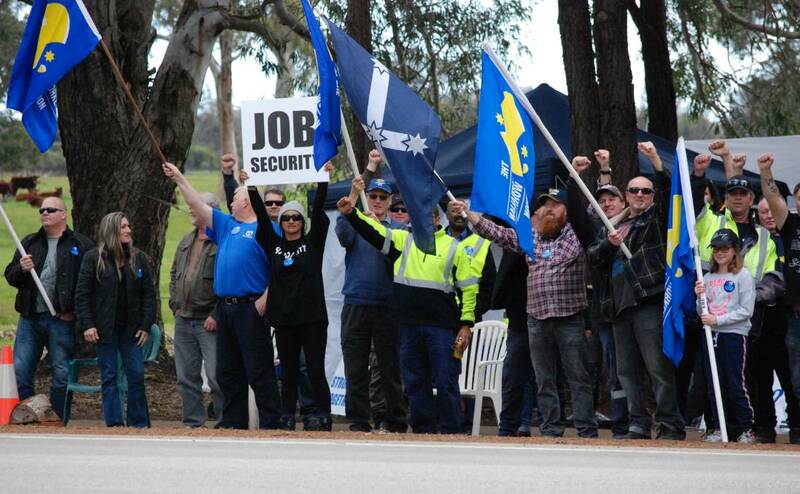 Approximately 1,600 workers across five sites in Western Australia have been on strike for the last six weeks. This course of action was taken after a new agreement was offered by Alcoa and voted against by 80% of its employees. The new agreement contained aims to cut 160 current jobs and outsource a further 400 jobs over a three-year period as well as remove provisions that guarantee no forced redundancies. It’s no surprise then that fears have been raised by workers and the Union that a change in agreements is a step towards casualization of the workforce of the world’s sixth largest producer of aluminium. What are the workers to receive in exchange for these changes? A paltry 1% pay rise and a one-off bonus of $3,000. These attacks have sent shivers down the spines of working people and their families who rely on stable and secure employment in these times of skyrocketing costs of living and high unemployment. No one would be foolish enough to shrug off these fears given that many of the workers involved have already lost some $30,000 per year in a recent restructure that was given the green light by the Fair Work Commission. It will come as no surprise to anyone that Liberal M.P and Federal Member for Canning in Western Australia Andrew Hastie has managed to turn the whole situation into a call for “global competitiveness” and further attack environmental safeguards blaming “green ideologues” for increased power prices and therefore increased production costs. No matter how many times one might listen to his speech you will not hear him suggest cuts to the salaries of Alcoa’s executives who never live in fear of their agreements being tampered with, nor would he mention power prices being the result of private companies profiteering out of what was once a nationally owned utility. The U.S owned Alcoa conducts operations in Jamaica, Ghana, Guinea, Iceland, Wales, Australia and the United States. It has a growing influence in all aspects of the aluminium industry through technology, mining, refining, smelting, fabricating and recycling. On top of this current attack on workers, Alcoa has had claims made against it that pollution from its Wagerup plant has impacted on the health of the local community. In addition to these concerns of the harmful effects of its emissions (ranked 15th among corporations emitting airborne pollutants in the U.S), it was charged with bribing Bahraini officials by the U.S Securities and Exchange Commission and the U.S Department of Justice in 2014. Uncertainty hit the aluminium industry on April 6 of this year when the Trump administration imposed trade sanctions on imports, with the only exemptions being Australia and Argentina, and eventually extending to South Korea and Brazil. Retaliatory tariffs were installed by various countries to recoup some of the losses made by the U.S sanctions. These sanctions came after falling aluminium prices caused by global overproduction headed by China whose production has been aided by a fall in coal prices and government subsidies in its aluminium industry. China’s aluminium production has at times this year seen some of its highest ever daily outputs. This follows 2017 where Chinese production accounted for 55% of the global total according to the International Aluminium Institute. This level of production has led to warehouses holding up to 433,110 tonnes of aluminium, which is four times as much as was being held in January 2017. Sanctions also hit the world’s second largest aluminium producer, the Russian owned Rusal which has added to the woes of the industry with stock piling up. The sanctions that have thrown a brick into the international trade flow don’t appear to have hit China too badly as they extend their reach abroad and continue their ability to flood the market with cheap aluminium. What this shows us is that apart from the inherent profit driven anti-worker actions of large corporations such as Alcoa, there are broader issues at play. Gradually falling stock prices and market volatility has these large multinationals scrambling to protect their large profits and doing their utmost to keep shareholders happy. What happens next? The same thing that always happens when the market starts tripping over itself, the workers cop the brunt and pay the price through “agreements” riddled with uncertainty. Attacks on working conditions by Alcoa aren’t limited to Australia. Similar action is taking place in Canada. Over 1,000 unionised workers in Alcoa’s Becancour smelter in Quebec have been locked out after their contracts had expired as the company wants them replaced with non-union and casual workers. There is little doubt that Alcoa is attempting to recoup some of its financial losses incurred in Canada, due to industrial action and U.S sanctions, via amending its agreements here in Australia. The workers at Alcoa deserve absolute solidarity of all Australian workers and progressive people as they strive merely to maintain the conditions and contracts that they’ve fought for over the years and should not be expected to take one single step back. *As this article was being published, striking Alcoa workers voted to return to work. Agribusiness companies hit workers AND farmers!